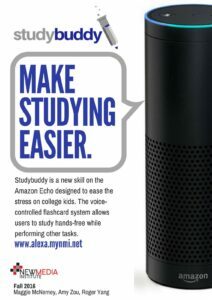 Studybuddy is a new skill on the Amazon Echo that makes studying easily fit into the hectic, busy schedules of young adults. The Amazon Echo is simply a smart speaker that can be controlled by voice. It’s purpose is to do one thing: make lives easier. The brains of the operation is what Amazon calls Alexa. Alexa is the software that can recognize every patterns of speech and turn it into something useful. Skills are accessed and controlled entirely by voice. With studybuddy, students no longer have to carry around piles of paper and notecards, but instead they can efficiently study their notes using studybuddy’s flashcard system. 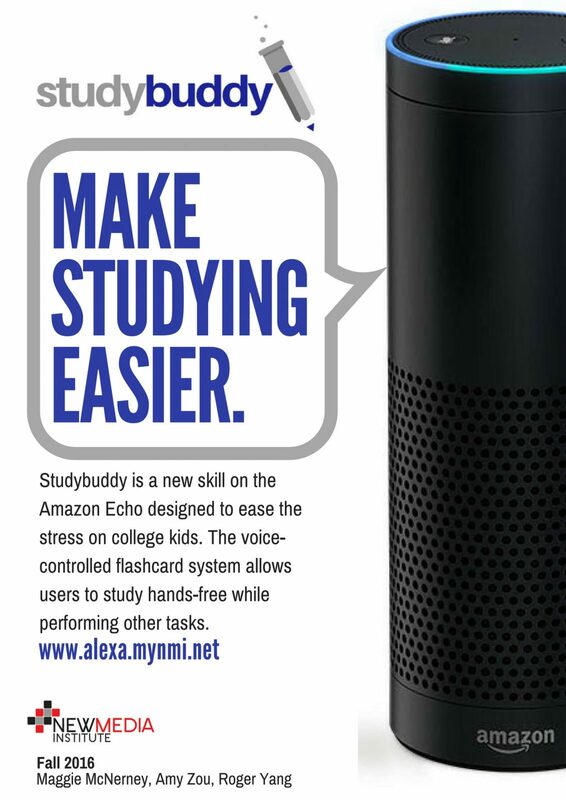 To open studybuddy on the Amazon Echo, simply say “open studybuddy”. Alexa will then respond with the category of flashcards that will be opened, and the quizzing will begin. As Alexa quizzes the user on the flashcards, the user has the freedom to work on anything else- making the interaction completely hands-free. Need to make dinner but can’t get yourself to put down the flashcards? No problem! Studybuddy can help you with that. Do you want to get in bed but not take your piles of paper with you? No problem! Study with studybuddy as you drift off to sleep. With studybuddy, you won’t have to lift a finger. Let studybuddy do all of the heavy lifting while you focus on getting all of your to-do list items out of the way.